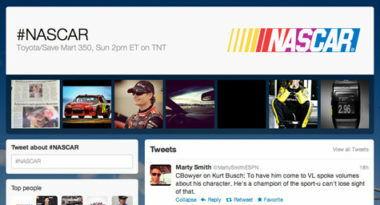 In a move to generate TV marketing revenue and get in on the lucrative NASCAR market, Twitter debuted a television commercial during the Pocono 400 and introduced the corresponding Twitter.com/#NASCAR hashtag. This is all part of Twitter’s larger marketing strategy to become the main online destination for people looking to engage and learn about their favorite brands. Techcrunch.com reported on how the social media service is striving to become the single source for brand conversation. Actually, Twitter is well positioned to achieve its lofty goals since it’s long played host to consumer conversation. The service’s extremely vocal and active users generate an abundance of relevant brand content and many brands are already using this content in their promotions and marketing messages. One of the primary brand benefits of the launch of #NASCAR is that there’s no need for brands to create any new content or do anything at all. Twitter has simply developed a way to collect and repackage the steady stream of comments that its users are tweeting about certain brands. This is completely different from the major promotional requirements of rivals like Facebook Pages which requires brands to develop, post, and push their specialized content. With this savvy marketing move, brands don’t have to do anything other than sit back, relax, and let Twitter users create the conversational content that Twitter simply re-purposes in a clear and compelling way. Basically, Twitter has replaced the effort of creating with the ease of curating all for the benefit of brands. Industry experts say that this social media strategy could become the future of social marketing. After all, the most trusted recommendations come from directly from consumers and there’s no better endorsement than those from brand fans. To incorporate Twitter into your company’s social media marketing strategy, contact MDG Advertising today at 561-338-7797 or visit mdgadvertising.com.